Cut the chicken into thin slices. Mix together the flour, five spice powder and seasoning, then place in a plastic bag. Add in the chicken strips and toss to coat. Heat half the oil in a wok or frying pan. 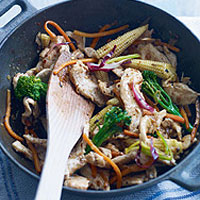 Add the chicken to the pan and stir fry for 3–4 minutes until cooked through, with no pink meat, and golden. Remove and set aside the chicken, then pour the remaining oil into the pan. Add the rainbow vegetables and chillies and fry for 4 minutes until almost tender. Return the chicken to the pan. Add the lemon zest and juice, ginger and syrup and stir-fry for 1–2 minutes to give a sticky sauce. Serve with fresh noodles or steamed rice. Use other vegetables in this dish, such as greens beans or shredded pak choi.